- Artwork is printed at high resolution with Fade Resistant inks, so that your colours remain Sharp and Strong. Extra Large XL 157.5cm Wide x 67.5cm High! We advise allowing a gap of approximately 3.5cm between each panel when hanging the set of canvases. EASY & QUICK TO HANG - All Canvases are supplied stretched, framed and ready to hang, with a FREE Hanging Template included with all sets, to enable accurate fast lining up of multiple split panels, as well as a handy groove on the reverse of all multi part frames to make it a simple & quick process for you to decorate your walls. PERFECT SIZE FOR OVER SOFA or BED - Dressing your room to impress ? 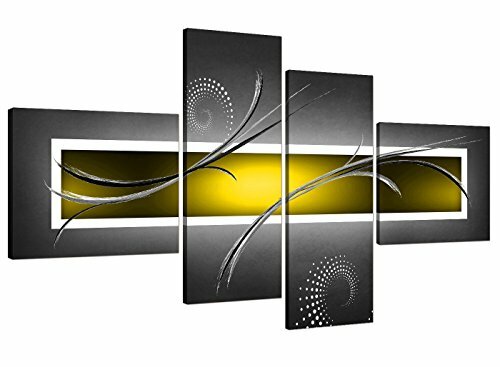 Then why not let this huge XL 63" inch x 26" inch piece of contemporary art provide that cool stylish finishing touch to your home ? The last piece of the interior jigsaw, so you can finally achieve that trendy designer décor look, with your pictures perfectly matching and accenting your curtains, blinds, rugs, & accessories, just like in the glossy magazines ! FAST & SECURE DELIVERY - Shipped speedily and securely, Next Day by Amazon, in super strong custom protective packaging, to ensure quick safe arrival at your home or office in A1 perfect condition...home shopping for wall art just couldn't be easier. LOVE IT 100% ...or YOUR MONEY BACK GUARANTEE - We are so confident that you will love your pictures, and complete the modern look that you desired, that we offer a 100% no quibble return policy on all of our prints.... As we are sure you will be back for more ! If you have any questions about this product by Wallfillers, contact us by completing and submitting the form below. If you are looking for a specif part number, please include it with your message. Modern Geometric Abstract Mt. Ranier on Canvas, 18" x 24"